Thank you for considering us as your drywall installation and painting company of choice. We’ve been proudly serving Naperville and the surrounding cities and we truly enjoy what we do. We know that our years of experience and our commitment to provide great work will show through in our final product. If you’re in need of any kind of drywall work or painting work, whether residential or commercial, reach out to us to see how we can help. We aim to be your first choice when you need a local drywall contractor in Naperville. Although drywall hanging is a relatively simple process, it’s definitely not an easy one. Just like any skill in life, it gets improved on with years of practice, and mistakes, and we’ve done both. Now that we have years of experience under us, we’ve become extremely efficient at installing drywall and we have the eye to foresee challenges before they come up. So, how big or small of a drywall installation project will we do? Like we said, we want to be your local drywall and paint contractor of choice and to do that we have to be able to take on the small projects as well as the large ones. We have the crew to take on multiple projects at once, big or small. If you’re thinking about installing the drywall yourself instead of calling a local drywall contractor then you’ll probably want to take into account a few things before you start. Mainly, what is your time worth? How long do you realistically think it will take you to complete the job? We’ve seen time and time again where a drywall project gets started but then it becomes a little tricky and an hour for one task turns into 3 hours and a 3 hour task turns into an entire weekend and a weekend task doesn’t ever get completed properly. 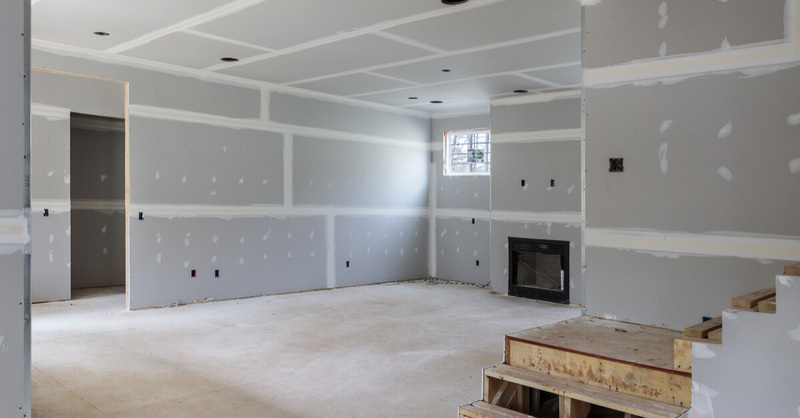 If you’re sure you can put up sheetrock on your own then, by all means, go ahead and do it, but if there are some aspects of hanging sheetrock that you’re just unsure about, you’re better off calling your local drywall contractor. It’s just not the best use of your time since you could be out doing other things or even making more money. Also, you’ll need to go out and buy tools, unless you already have everything you need? Do you anticipate taking part in another large drywall project? If not, then you’ll just be buying tools to then store in your garage and collect dust. That’s not worth it either. Having unsightly holes, cracks or dents in your wall is frustrating and embarrassing when you have company over and they notice it. Whether it’s because of a door knob that was accidentally thrown into the wall when opening the door, your boys being boys, water that destroyed your drywall, or your puppy chewing through the walls (it happens more than you think), we can repair drywall in any condition. The need for a drywall repair contractor comes in very frequently and we see it most often when water damage has taken place. The water will wick up through the drywall until it has absorbed as much water as it can. As it does that, it can cause mold damage in the walls and need replacing. Mold can be very harmful if it’s constantly being inhaled. Generally when we see water damage to drywall it gets absorbed up to three feet from the ground. This can vary depending on how much water entered your home but if it’s due to a strong storm it’s usually no more than three feet. It causes swelling, buckling, and disintegration of the walls and when we see this, we remove the drywall, assess the area for mold, remediate if necessary and then hang new drywall, and finish it off with paint if desired. In most instances, we can repair drywall in just a few hours and it will look as if nothing ever happened. Call us today to see how we can help you with your drywall needs. We are also professional painting contractors skilled in both interior and exterior painting of your home and always provide the highest quality professional finish for all our clients. Our residential and commercial clients receive a broad range of services ranging from simple paint projects to complex faux finishes. If you’re looking to paint your business and give it a face lift, we understand. After all, you never get a second chance at a first impression. Our crew excels at commercial interior paint jobs and we’ve got all the tools necessary to do a perfect paint job. We are quiet and work methodically so that you’re office isn’t full of ladders and paint everywhere. We make sure to clean up after every work day and after completion of the project. We want to be your painting contractor of choice and we work hard to earn your business on every project. Residential painting is at the core of our hearts and our business. We truly enjoy creating a space where homeowners want to come home to and we love helping to make homes extremely personalized. From kitchen spaces to kids bedrooms, basements and theatre rooms, we can help you select a color that brings out just the right mood. We do excellent work and we are never done until you’re completely satisfied with the end result. We believe that if we want to be the premier drywall and paint contractor of Naperville then we need to prove our value on each and every job, and it’s what we strive to do! Give us a call today to see how we can help. Our service area is mostly in Naperville and the surrounding suburbs, but we’ll certainly travel to where our clients take us. We also service Chicago, Elgin, Aurora, Wheaton, Bolingbrook, Orland Park, Joliet, Carol Stream, Downers Grove, Lombard, Romeoville, Oak Lawn, Yorkville, St. Charles, and La Grange. We do our very best to be flexible with your schedule so give us a call today to see how we can help! We’re Committed To Doing Every Job The Right Way! We know you have many drywall contractors to choose from and we don't want to be "just another one". We strive every day to do great work and exceed your expectations with our professionalism and honesty. We may be a bit old fashion but we believe in doing what you say you're going to do. That's how we feel we'll stay in business for years to come. Who has time to play games? You'll get honest and very fair pricing from us. We do our best to work around your schedule and we even offer emergency visits. We have years of experience and we do quality work. We are efficient and quick.